Like many kids, I was active in sports. The more physical and demanding the sport, the more I loved it– football was my big favorite. So when I broke my neck, I never imagined that I could ever replace that rush of adrenaline that I felt when I was on the field. Much to my surprise, a couple of years after my injury I found Murderball and (figuratively) ran with it. It fulfilled every need I had for competition, physicality, and fitness. Equally as demanding mentally as it was physically, I quickly fell in love with the sport and have now been playing it for 8 years. I want to share this sport with you because of the profound impact that it has had on so many disabled athletes like myself. Not only does it function as a recreational sport– it creates a closely knit community. 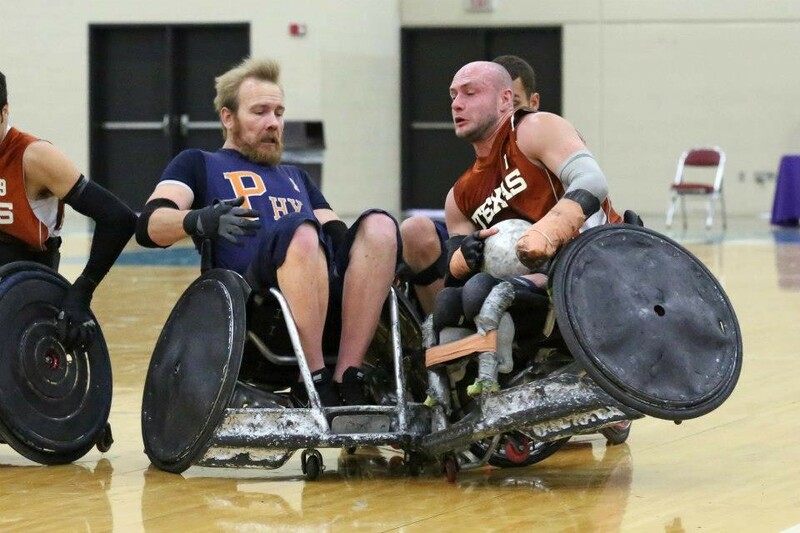 It’s typical to be at a wheelchair rugby tournament and overhear a group of players hotly debating the best technique for picking up a dropped credit card, or perhaps the most effective way to pump gas. We are brought together for sport to connect as athletes, but it is our lifestyle and our challenges that truly connect us as people. So let’s get down to it, what the heck is it anyway?? 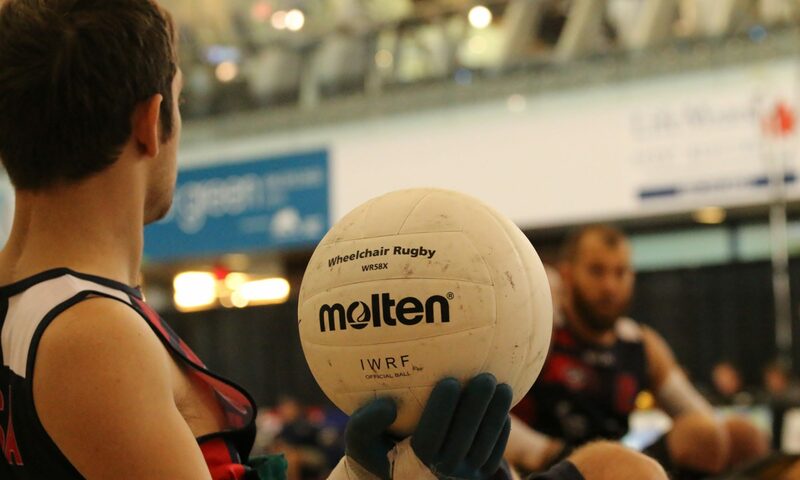 Wheelchair rugby is a Paralympic sport that is in a class of its own. I would argue that it is the most exciting Paralympic sport to watch, but perhaps I’m just a smidge biased. The game itself is a bizarre mix of several sports, played with a volleyball on a basketball court. The sport shares many similar court rules as basketball, and for a quick list of them, check here. Four eight minute quarters make up one game, and the objective is to score more points than your opponent by crossing the goal line with two wheels while the ball is in your possession. Doing this grants your team one point. While the offense tries to achieve this seemingly simple goal, the defense tries to stop them– by physically running into them. The United States has the largest and most competitive club league in the world. It consists of 42 teams, with a maximum of 15 players on each team. While only four players are allowed on the court from each team, having a deep bench is important to match up against a variety of opponents. Those 42 teams are scattered throughout the country and so competition includes a lot of travel. If you happen to see a large group of people in wheelchairs rolling through an airport, hope that they’re not on your same flight. loading 15 people in chairs onto a flight is no quick feat, and is often slowed by overhelpful flight crew. One basketball court, eight wheelchairs, lots of noise. In a nutshell, that’s Murderball. That sounds awesome, can I play? While you likely can’t play in an official tournament, you can contact a local team and most of them will welcome you out to a practice. If they’re an extra cool local team they’ll even put you in a chair and let you play with them a little bit. It’s a win-win for them because if you’re better than they are, then congratulations you just beat a bunch of cripples. In the more likely event that they are better than you, then man up– you just got beat by a bunch of cripples! Ok, I guess I can’t play– how do I get involved? Every team can always use volunteers to help us out at tournaments or practices, so if this really does sound interesting, please get involved. You can find more information at the United States Quad Rugby Association website. Any questions about the sport? Ask me in the comments! Next PostNext How Can You Even Drive?